Over the past few years, our membership has grown across the country. With that growth we have seen hundreds of new members of Indian ethnic origin. 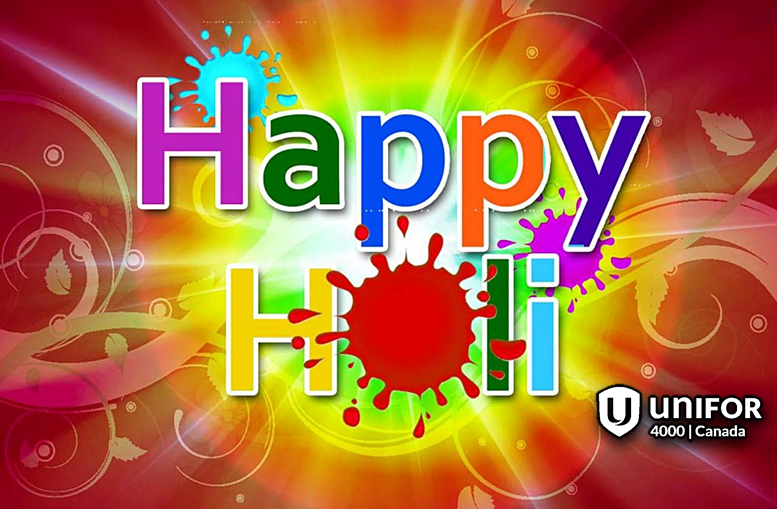 With many hundreds of Indo-Canadian members, we thought it was only appropriate to post an article on our Unifor Council 4000 webpage about the Holi Festival, which starts on March 6 and ends on March 7. Holi is an ancient Hindu religous festival, known as the festival of colours or the festival of love. It is said to signify the victory of good over evil, about people meeting to play and laugh, forget and forgive and to repair relationships, and also to celebrate the arrival of spring. The arrival of spring is something us Canadians will relish this year after a long, cold snowy winter. So why not attend a Holi Festival in your area. The festival, which is celebrated all over India and now has spread all around the world, is all about enjoyment and partying, begining with a Holika bonfire on the night before the festival where people gather to sing and dance. Revellers hurl brightly coloured, perfumed powders and water at one another, all of whom are considered fair game regardless of gender, caste, class or age. The festival is full of colour and takes place all over, in streets, parks, outside temples and buildings with groups carrying drums and musical instruments. It is a wonderful event.